7' black rat snake looking for a quick meal. 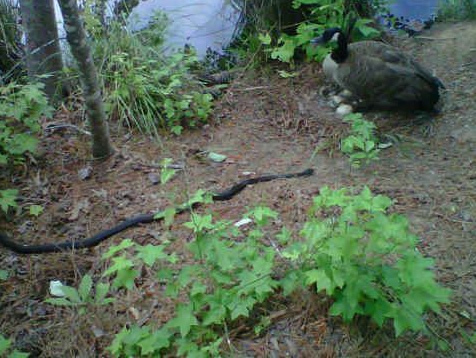 Whether venomous or non-venomous, snakes pose quite the problem where there is a close proximity to humans. Most people think “the only good snake is a dead one”, and people think that because they are terrified of snakes. For good reason, approximately 8,000 people every year are bitten by venomous snakes. 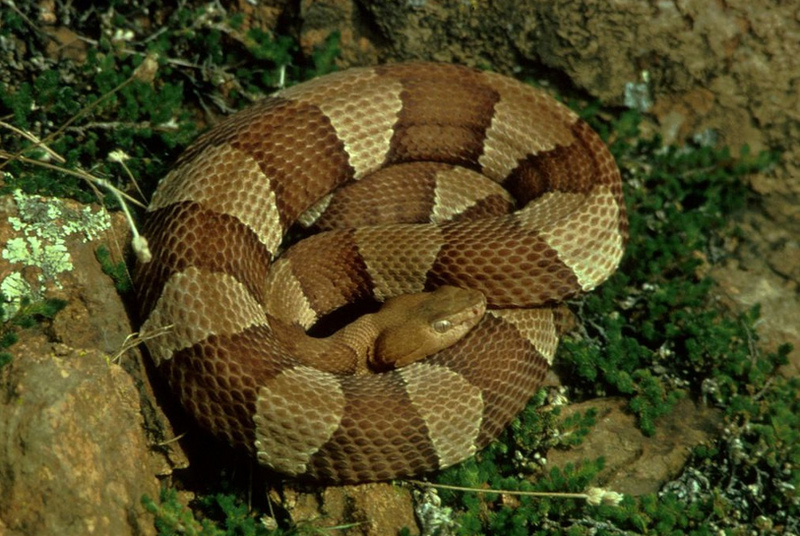 There are six venomous snakes in Georgia: Timber Rattlesnake, Eastern Diamondback Rattlesnake, Pygmy Rattlesnake, Water Moccasin/Cottonmouth, Copperhead, and Coral Snake. All of these snakes are deadly to humans and pets. Most snakes will not bite unless provoked, that is why it’s extremely important to leave snake removal to professionals. Trying to remove a snake yourself can result in death or at the very least a painful bite that may require medical treatment. And even with medical treatment some of the effects of snake bites can be long lasting. Snakes are on your property because they are seeking a food source or because they are looking for a suitable place to reproduce. Snakes don’t jog 10 miles every day to capture their food, they live on top of their source of food. Venomous and non-venomous snakes eat small rodents such as rats, mice, chipmunks, and voles. In order to control your snake problem, the snakes and food source need to be eliminated. Sometimes snakes utilize homes as a place to host their offspring. After breeding female snake seek a suitable habitat to lay eggs that is far away from any nest predators such as raccoons and opossums. Many times crawl spaces under homes make perfect areas for this. Often times, a wildlife management program is needed to insure success in removing both snakes and their food sources. Xceptional wildlife biologists are prepared to handle any problem you may have. Wildlife management programs for snakes often include; 1. Trapping/removal of snakes, 2. Deterrent applications, and 3. Removal/eradication of food source(s). Xceptional biologists are prepared to hand-remove, deter, and/or trap snakes on your property. Applications of commercial-grade deterrents may be utilized to help prevent snakes from accessing particular areas and to deter general populations of snakes. We also will aggressively work on eliminating food sources from your home or property. Additionally, Xceptional Wildlife biologists will make suggestions or recommendations to alter your property to remove harborage or potential harborage areas for snakes and/or their food source(s). Call Xceptional Wildlife Removal today to have an expert biologist examine your home and property! Why you shouldn’t try to solve your snake problem yourself. As we mentioned earlier snakes can become extremely aggressive if they feel threatened by humans. Gravid (pregnant) females are particularly aggressive since they are protecting their unborn young, and if you see a hatchling then you can be certain other hatchlings are in the area. Trying to remove a snake yourself usually just angers the animal and provokes strikes. Removing a wild animal is not worth your life, please do not try this yourself, and leave it for professionals. Timber Rattlesnake (Crotalus horridus): The Timber Rattlesnake is a large, 36” to 60”, venomous snake found in Georgia. It is large bodied and can be very aggressive, especially if it feels like it’s being attacked. Eastern Diamondback Rattlesnake (Crotalus adamanteus): The Eastern Diamondback Rattlesnake is the largest venomous snake in North America, with the largest recorded specimen being 99 inches (8.25 feet). Like the Timber Rattlesnake the Eastern Diamondback can be very aggressive if it feels threatened, and this species has strike range of one-third of its body. Pygmy Rattlesnake (Sistrurus miliarius): The Pygmy Rattlesnake is the smallest rattlesnake, 16”-20”, species found in Georgia. This species is very difficult to deal with because of their small size, than can hide under leaves, rocks, branches, and any other small item left outside or inside your home. Water Moccasin/Cottonmouth (Agkistrodon piscivorus): The Water Moccasin or Cottonmouth has the reputation as being one of the most aggressive snakes in the United States. They range in size from 36”-70” and are heavy bodied snakes. They are commonly found around water, such as swamps, retention ponds, back yards streams, and any large body of freshwater. Copperhead (Agkistrodon contortrix): The Copperhead is a smaller species ranging from 20”-37 “. Their preferred habitat is on the forest floor where their color and pattern camouflage them in the leaf litter. Although not the deadliest of the North American species they can inflict a painful bite that requires medical attention. Coral Snake (Micrurus fulvius): The Coral Snake is probably the most interesting of the venomous snake species found in North America. The coral snake uses neurotoxin, the neurotoxin used by the coral snake is similar to that of the cobras. The venom kills by paralyzing the victim by interfering with nerve signals to the diaphragm and the victim slowly suffocates. A coral snake can only bite me on my earlobe or on the web between my fingers. This is completely false, coral snakes like any other snakes have hinged jaws and can open their mouths wide enough to bite any part of your body.